A lovely koi pond can be the focal point of your back, side, front, court or any yard! If you’re like us, you enjoy the serene beauty of a well-kept koi pond and enjoy the peace it can bring to your home. 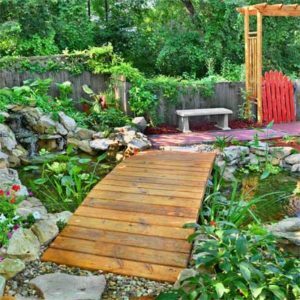 Traditional Japanese style ponds are lovely and popular for a reason, but if you are looking for a style a little more non-traditional, we have a couple of ideas for you. Not every koi pond needs to be covered in foliage to maintain the essence of the outdoors. The clear water, green tint, and wide open space gives this pond a feel of a lake. 2. 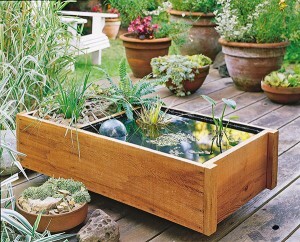 Pond in a Box! The title says it all. This pond doesn’t even look like a pond and can go virtually anywhere! You aren’t even limited by how much yard space (or money!) you have. Click on the picture for detailed, step-by-step instructions to replicate this fine koi pond in your own backyard. The above image is just one of many bridge over pond ponds. Traditionally, a koi pond is placed in the back, side, or center of a yard, with plenty of space to maneuver around or in front of. 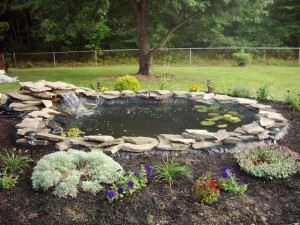 When looking for images of ponds, increasingly there are ponds you can incorporate into any space! So long as you do mind and it is safe walking over water. This is a fun pond because it takes the traditional art of the pond and converts the style into a traditional home, creating a cool art house design. The enclosed area mixed with the wooden panels adds an element of classic, timeless look. 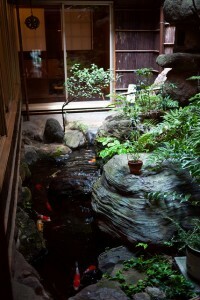 Typically this is the type of koi pond design that one dreams of adding into their home. This garden koi pond comes complete with a small waterfall and can easily expand to include more fish and/or flowers to make your yard come alive. Whether you are a traditionalist or not, this list of unique koi ponds was sure to include some eye candy for the dreamers or simply the admirers. If you have come across any truly unique koi pond designs, leave us a comment! Looking for the best care for you koi fish? Visit Sweeney Feeders for premium automatic koi feeders to save yourself time and effort while effectively providing for you koi.